I have a board on Pinterest for Save the Date ideas. There are a lot that I'm in love with, so I'm not sure how I'm going to narrow it down. Luckily for me, we don't have a date yet, so I don't have to make a decision. I love Save the Date cards, but they're just so expensive. I fell in love with Save the Date magnets -- but they're about $2.50 each. That definitely adds up. If you have a date already but no cards, you're in luck. You can get ten free Save the Date cards or postcards for free from Wedding Paper Divas. Just click that link to head over to the site (which has a ton of wedding stationary), choose your favorites, and add them to your cart. When you're done, enter the code 10WEDSAMPLES at checkout, and your cards will be free. If you choose standard shipping, that will be free as well. If you got engaged recently, you probably don't have a date. Don't worry. This is just to give you an idea, which will definitely help you later on. 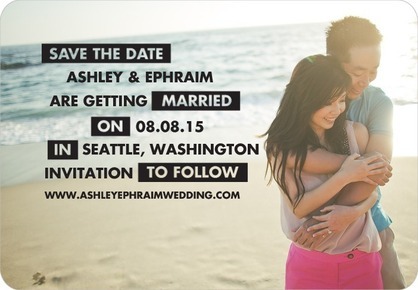 BRIDAL BABBLE: Do you plan on sending out Save the Dates?